Great for work lunches, dinner parties or filling that big bowl for yourself before heading to the couch. If there’s one thing we love, it’s a salad that eats like a MEAL. And don’t let anyone tell you that meat-free meals aren’t as satisfying as any other — gaze at this tray of colour and be reminded that nothing tastes as punchy as a radish, or as creamy as a ripe avocado. Plus, with its pita bread croutons and ranch dressing made with tahini, we can crunch to our heart’s content. Pass the forks. This hearty and healthy salad is a like a cobb salad and Middle Eastern fattoush salad in one. The zesty tahini ranch dressing can also be served as a dip, and the pita chips can also be flavoured with store-bought za’atar seasoning to taste. Top the salad with crumbled feta cheese if you like — it can be modified to suit your tastes. Preheat oven to 400F degrees. Split pita bread and cut into 1-inch cubes. Toss together with oil and salt, and spread in single layer on a parchment paper-lined baking sheet. Bake for 8 to 10 minutes or until they are golden brown, crisp and toasted. Cool completely. Whisk together the tahini, lemon juice and water until smooth. Whisk in the yogurt, olive oil and honey until combined. Then stir in the garlic, dill, parsley, chives, salt, pepper, cumin and cayenne pepper. Place the kale on serving platter. Arrange avocado, tomatoes, carrots, cucumbers and radishes on platter with kale. Sprinkle chickpeas and Pita Croutons over top. 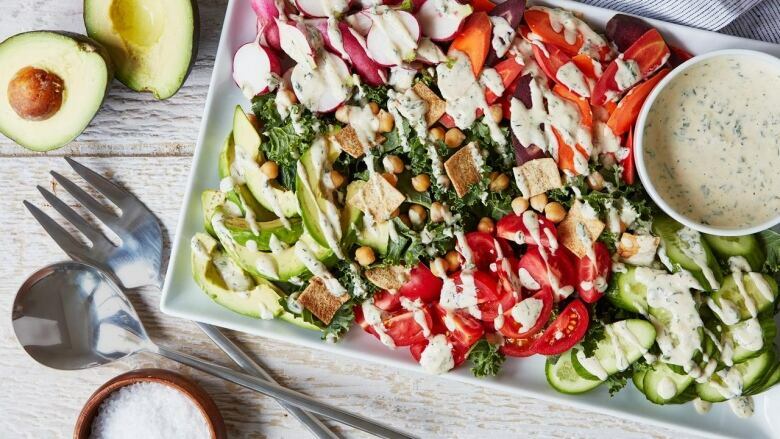 Drizzle some Tahini Ranch Dressing over salad and serve with remaining dressing. Alternatively, toss all salad ingredients together with dressing and serve.